In our blogs here at Buy Owner, we’ve said time and time again that the way you present your house determines how potential buyers will react to it. And common advice tells you one way to do this is to add greenery in or around your home. If you’re like most people, you may be thinking you don’t have time or luck keeping plants alive. Don’t worry! There are many easy-care plants that won’t require extensive upkeep! Your house will still contain a homey atmosphere without daily plant labor being added to your already busy schedule. Whether you’re looking for an eye-catching hanging basket for your front porch or a small table plant for your living room, outdoor and indoor plant options are available in abundance. Here are some top indoor and outdoor choices that are nearly impossible to kill. Hostas- Hostas evolved in Asia and contain an appearance similar to lilies. They are perennials, which mean they survive each year. The variations in the leaf and flower colors are numerous and continue to evolve. Though the flowers exhibit unique and colorful traits, the foliage is what catches the eye of most people. Lush leaves grow around the flowers and continue to spread each year. Care: Water occasionally and place in a spot that receives afternoon sun. 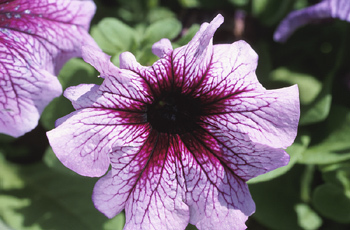 Petunia- Petunias originated in South America and bloom all summer long. Because they are annuals, they are a perfect fit for someone who just wants to exhibit flowers while showing their house during the summer months. Care: Rest the petunia plant outside in full sun and water regularly. Daylily- Originally from Europe, lilies present some of the most colorful, lush flowers you will find. Daylilies are perennials, but each flower only blooms for one day. Daylilies are perfect for picking and displaying in a vase indoors, or for filling a garden with outdoors. Care: Place in full sun and water once weekly for the first year. Russian Sage- Originating from places with rough land, this plant can handle almost any environment and spreads quickly for a full, healthy look. The foliage consists of grey leaves and lavender-blue flowers that originate in late summer from the top of the stems. Care: Place in full sun outside and water once a week for the first year. Coneflower- Coneflowers are where the herb Echinacea originates from. Echinacea is known for helping to boost the immune system and fight off cold and flu symptoms. Coneflowers offer colorful flowers (shaped like cones), a fresh fragrance and a healthy snack for birds in the fall and winter. Care: Plant in full sun or light shade. Water these plants only until they are established. They will retain moisture after this point. Moss Roses- If you’re looking for an annual with a long-lasting bloom period, moss roses are what you need. These plentiful colorful flowers can even grow in dry areas where drought is common or in poor soil. Care: Plant in full sun, preferably a dry area. Water seldom, if at all. Cast Iron Plant- These plants can grow outside and can survive inside. They are the perfect plant for those who cannot seem to keep a plant alive. They survive in low lighting without regular watering. Pointed sword-like leaves grow right out of the soil. Small purple flowers appear from the soil surface. Care: Place in a cool area of your house with low light and water occasionally. Holiday Cactus- These special cacti are as easy to care for as regular cacti, but are unique in that they can bloom during whenever you plan to show your house. Different types bloom during different holiday seasons, so ask your florist which type you should buy. They flower when set in a cooler temperature. Care: Place in artificial light during the day and total darkness at night. Water rarely, but thoroughly. Water less and place in a cooler temperature right before you want them to bloom. Bamboo- For an artistic style, bamboo stems often come planted in a stylish container and can live with practically no care or light. Bamboo stems curve up into ringlets. Each stem looks different from another. You can place these anywhere that you have extra table or shelf space. Care: Offer the bamboo a little bit of water every so often. Spider Plant- Spider plants are ideal for hanging baskets. Not only are these easy to care for, but they spawn babies so that the plant continually grows. You can allow it to grow as large as you prefer it, or you can cut the baby plants off and share it with others. Care: Place in a cool area and next to a window so that it receives natural light but is not placed directly in it. Water them once a week. Aloe Plant- Aloe is a gel found in these thick leaves and is used to cure scrapes, burns, etc. Not only do you receive an easy plant to care for, but you also receive free aloe gel from inside the leaves to use when someone injures themselves. Care: Water sparingly in the winter and soak in the summer; let the soil dry between each watering. Place by a window in direct sunlight and never let it reach freezing temperatures. Peace Lily- A peace lily can grow anywhere but offers a tropical appearance. Not only do peace lily plants possess full, unique flowers, but this plant generates lots of oxygen that refreshes the air in the room that it rests in! Care: Place in room temperature and out of direct sunlight. Water it once or twice a week.